When you smoke a cigarettes nicotine is released with the smoke from the cigarettes and the smoke you exhale. This nicotine is deposited on any surface that this smoke comes into contact with. When nicotine enters your system it causes a very rapid constriction of the blood vessels and this interferes with your blood circulation. Blood carries all the nutrients we need to the cells in the body and carries away the waste from our cells. When you decrease the blood circulation you reduce the nutrition to the cells and the waste is not removed. In effect you are starving the cells and not removing the waste. Not a good situation. As well as interfering with the blood circulation this sudden constriction of the blood vessels caused your blood pressure to jump which exposes you to stroke. Nicotine very easily passes through the skin barrier and therefore when you come into contact with a surface that has nicotine it enters your body and you get exposure to second hand smoking. When you pass through a cloud of smoke from a cigarette the results are also the same. When you smoke and then pick up a child you expose the child to all the nicotine that is deposited on your clothes. It makes sense to quit smoking cigarettes and it makes even more sense if you have children to stop smoking. 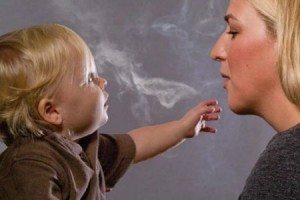 We have no idea of the potential effects from passive smoking on the development of a child. When you quit smoking you not only have an effect on your health but on the health of others around you. Previous	Do you want to Quit? Next I SMOKE. WHAT’S YOUR EXCUSE?